Having an old pic like that is seriously cool. I'm gonna dig out the picture of me when I was 6 years old on my first 20 incher. What a great photo. I don't know if you were an Angry Young Man, Matt, but you certainly look a little grumpy in this one. What's this? No cycling specific clothing? What was breaking in the Brooks like in your Levi's? I do look a bit surly in that photo but was then and remain generally pretty genial. I did have cycling shorts and a shirt with me and wore them on the big mileage days, and the shorts served double duty as swimming trunks. 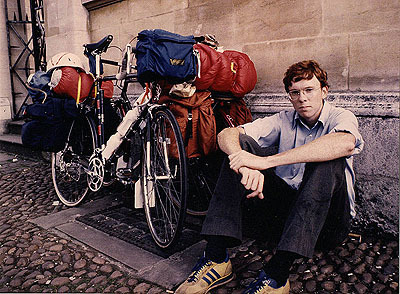 We had quickly discovered that bikes didn't cost extra on trains and so used British Rail to make miles and then the bikes to get around, so often wore regular clothes. I had four uncles running pubs at that time so it wasn't always intensive cycling! These Filson Whipcord pants (wool!) were my main trousers for the trip, and there is a pair of leather cycling shoes lashed onto the rack. The Brooks saddle is already five years old in this photo and was mostly broken in wearing cycling shorts.